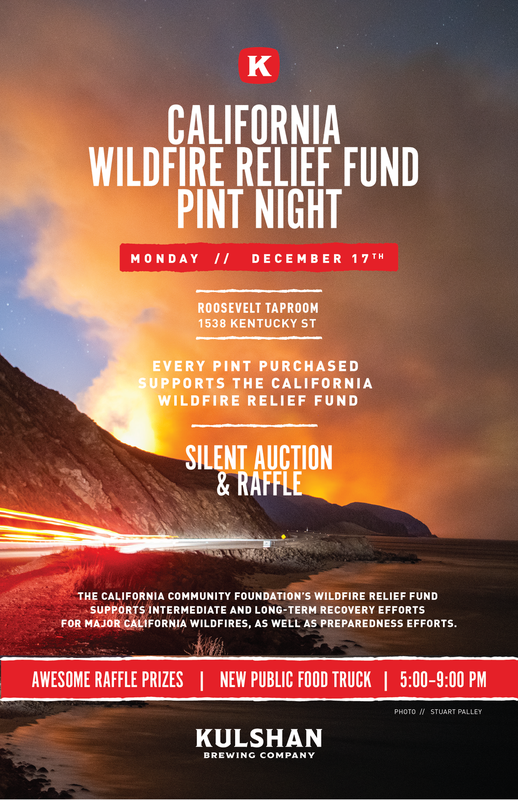 Join us for the California Wildfire Relief Fund Pint Night at Roosevelt (K2)! Every pint purchased supports the California Wildfire Relief Fund, an organization that supports intermediate and long-term recovery efforts for major California wildfires, as well as preparedness efforts. There will be a silent auction and some awesome raffle prizes from 3 OMS YOGA, Bellingham Food Co-Op, Village Books, Pickford Film Center, Tony's Coffee, The Confluence Fly Shop, Leavenworth Mountain Products and dozens of photos, paintings, ceramics and other art from artists all over the country. Invite your friends, drink some beer, support a great cause, and bid on some cool local gifts right before Christmas!